The original Star Trek adventure that started the enduring sci-fi pop culture phenomenon. Since this is my fourth examination of Star Trek’s “Original Series”, I won’t reiterate my thoughts about the various episodes here. If you’re interested in my comments about each of Season Three’s 26 shows, click here and give them a look. The Cage (Extended Version) (version never aired). Back when I looked at the remastered episodes in the 2008 DVD set, I noted one major change: all the episodes sported new and “improved” visual effects. This meant computer-generated material more in line with current standards. This mostly affected shots of space, but some other pieces – like the fire from phasers – also got an update. I wasn’t especially wild about the altered effects. Sure, they looked great – a little too great, I thought. They didn’t fit in particularly well with the semi-clunky look of everything else in the “TOS” world. With these Blu-Ray transfers, fans can have their phasers and fire them too. The discs use the “angle” feature to allow us to easily toggle between the original effects and the updated ones. I’m happy to have the option, as I prefer the old visuals. Yeah, they’re ugly, but they’re Trek! 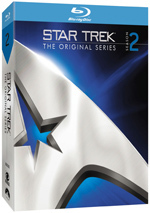 The Blu-Ray also provides the series’ original monaural audio for the first time. As I’ll mention when I get to the tech ratings, I like the multichannel remixes quite a lot, and I’ll probably opt for those whenever I watch Trek. Nonetheless, it’s great to finally hear the shows back in their original mono. Even when I like a remix, I always think the original audio should appear as well. Star Trek appears in an aspect ratio of 1.33:1 on these Blu-ray Discs. While the first two years looked good, Season Three presented the series’ strongest visuals. Across the board, sharpness looked quite good. Little softness appeared, as the episodes consistently demonstrated good delineation. I witnessed no issues with jagged edges or shimmering, and edge enhancement wasn’t a factor. Print flaws remained virtually absent in these clean, fresh shows. The series went for bright, dynamic hues, and they looked terrific. The colors seemed lively and vivid throughout the year. Blacks remained dark and tight, while shadows demonstrated good definition. Season Three barely showed its age via these excellent transfers. In addition to the original monaural, the package presented remixed DTS-HD MA 7.1 soundtracks that worked well. The soundfields remained pretty heavily oriented toward the center, but they opened up quite a bit. Many sounds came from the front right and left channels, and we also heard occasional activity from the rears. The surrounds often gave off some good ambient information - like the hum of the Enterprise - and split surround usage occurred on occasion, such as when the ship flies by or when a phaser blast heads to one side. No one will mistake these tracks for modern efforts, but the effects seemed pleasing. Audio quality also held up well. Dialogue appeared clear and reasonably warm and natural, with no intelligibility problems. Music showed pretty good pep, and effects came across quite well for the most part. Although some distortion could interfere with those elements, they usually stayed clean and boasted some good bass at times. The remixes didn’t reinvent the wheel, but they added zip and involvement to the proceedings. How did the Blu-rays compare to the remastered DVDs from 2008? Audio came across as warmer and fuller, while visuals appeared tighter, cleaner and more vibrant. The Blu-rays offered the strongest representation of the source to date. Most of the set’s extras show up on Discs Five and Six, but a few tidbits appear on the other platters. 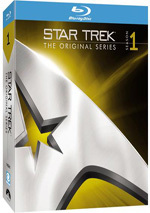 Disc One opens with ads for various Trek Blu-ray and DVD releases as well as Star Trek Online. All the discs also include previews for the Season 3 episodes. Each of the first four discs includes Easter Eggs. These are easy to find: just highlight the red button on the main menu. When activated, these display brief featurettes: “Romulans or Klingons?” (2:03), “The Bottle Show” (1:31), “Birthday Shuttlecraft” (1:31) and “Flint’s Castle” (1:32). These clips look at elements related to “The Enterprise Incident”, “Let That Be Your Last Battlefield”, “The Tholian Web” and “Requiem for Methuselah”. They’re mildly interesting. After this we get Life Beyond Trek: Walter Koenig. In this 10-minute, 49-second piece, we hear from the actor as he discusses how he ended up on Trek as well as subsequent acting work and his collection of comics, toys and other things. Given the distance that so many Trek actors seem to put between themselves and the series, it’s fun to see how Koenig embraces the geeky side of things. Another supporting actor comes to the fore in Chief Engineer’s Log. In the six-minute, two-second program, we get notes from actor James Doohan. He talks a little about how he landed on the show and the series’ legacy. There’s not much to it, as Doohan - shot in December 2003 - clearly wasn’t doing well enough to offer substantial comments. However, it’s nice to hear a little from him, as he went absent in most of the extras in prior packages. For Memoir from Mr. Sulu, we take eight minutes, 33 seconds to hear from Takei. He discusses his thoughts about what Sulu did after Trek, the series’ impact on his life, and his activities related to the preservation of Japanese-American history. The latter element fills most of the featurette and gives it some heart, especially when Takei gets into his childhood experiences. For Disc Five’s final featurette, we get the nine-minute, 35-second Captain’s Log: Bob Justman. We hear from Justman himself as well as Nimoy, visual effects producers Mike and Denise Okuda, illustrator Doug Drexler, and writer David Gerrold. “Log” acts as an appreciation for the now-deceased producer. It avoids becoming a gushy piece of fluff, as it actually gives us nice notes about what Justman did on the series. Though not nearly as famous as Gene Roddenberry, Justman was crucial to the franchise’s success, so it’s nice to see him get credit. On Disc Six, we get an unaired alternate version of Season One’s “Where No Man Has Gone Before”. It runs 52 minutes, 22 seconds and comes with a few notable differences, such as an unused prologue. This becomes a fun piece of history. Next we get David Gerrold Hosts 2009 Convention Coverage. In this 19-minute, 25-second piece, writer Gerrold visits two conventions and interacts with Trek actors Chase Masterson, Celeste Yarnall, Evan English, Lawrence Montaigne, Robert Picardo, Nichelle Nichols, and Nana Visitor as well as various fans. Not much of interest arrives in this superficial piece. Two more 2009 Comic-Con featurettes follow. The Anthropology of Star Trek goes for four minutes, 14 seconds and presents notes from Professor Daryl G. Frazetti and fan Jacob Hurd. Though this purports to be a serious effort, in reality it just praises the diversity of Trek fans. It’s pointless and self-congratulatory. Also from 2009’s Comic-Con, The World of Rod Roddenberry lasts seven minutes, 14 seconds and provides remarks from the series’ creator’s son as well as others. They offer some introspective thoughts about Gene Roddenberry’s archetypes, but “World” mostly remains laudatory and without depth. Next we find Billy Blackburn’s Treasure Chest: Rare Home Movies and Special Memories Part 3. This 10-minute, 53-second collection provides comments from actor Billy Blackburn along with his reminiscences about working on the series as Lt. Hadley and some other tertiary or stand-in parts. We also get to see some of the silent 8mm film Blackburn shot on the set. The actor provides some interesting notes about his time on the series, and the footage proves fun to see. To Boldly Go… Season Three presents a 22-minute, 28-second featurette. We find information from actors Leonard Nimoy, George Takei, Nichelle Nichols, Walter Koenig, and William Shatner, Trek activist/author Bjo Trimble, producer Robert Justman. They discuss the campaign to bring Trek back for a third season and issues related to keeping it on the air, Gene Roddenberry’s departure from the series, production changes, the series’ end, and notes about a few particular episodes like “Spectre of the Gun”, “Plato’s Stepchildren”, and “Spock’s Brain”. Not a lot of depth shows up here, but the program gives us some interesting tidbits. The anecdotes prove entertaining and the information becomes generally useful in this decent little piece. In Star Trek’s Impact, we get a eight-minute, 54-second look at that topic. We find comments from Rod Roddenberry. He discusses his thoughts about various elements of the series’ philosophy and presentation of various elements. Roddenberry doesn’t delve into things all that well, and these are subjects Trek fans will know, as he mainly reiterates well-known concepts. Collectible Trek lasts 14 minutes, 21 seconds and provides notes from Nimoy, Rod Roddenberry, archivist Penny Juday, model and miniature designer John Long, Art Asylum’s Manuel Jesus, and collector Doug Shannon. We hear about various collectibles related to the series, both in the form of original series props and subsequent licensed pieces. We also get to see quite a few of these elements. This becomes a nice little tour of the different Trek collectibles. The Original Series remains my favorite of the Trek programs, though it’s tough to recommend Season Three for casual fans. While it offers some good episodes, it has more clunkers than you’ll find in the first two years. The Blu-rays offer very good picture and audio as well as a mostly informative set of supplements. 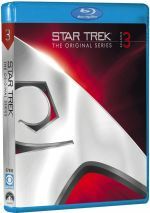 Even “weak” Trek can be enjoyable, so Season Three offers entertainment, and the Blu-rays deliver the shows well.